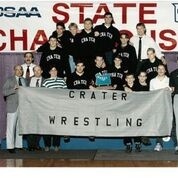 The 1993 Crater High School wrestling team was the first team from Crater High School to win a state championship. They were led by state champions, senior Steve McNamee and junior Nolan Rubus. Other state placers were Kevin Tuers 2nd place, James Wespremi 3rd place, Ryan Robinson 4th place, Tyler Lowder 5th place, Brandon Gray 5th place and Matt Walker 6th place. They were coached by Head coach Greg Haga, and assistant coaches Rey Guevara, Dan Speasl, John Hill and Jay McRoberts.